You’ve probably heard of Mr. Pareto by now. If not, allow me to introduce you. After all, he may be directly related to your ability to achieve the goals you’re setting for yourself. You’ve probably seen the Pareto Principle in your own place of business, where it appears that some individuals are by nature much more productive. It appears that way because it’s true – they have made a conscious decision to be part of the 20%, and will go on to reap all of the benefits and rewards that come with that commitment to giving their very best. But here’s the challenging part when it comes to personal development; Mr. Pareto is alive, well and close at hand. How many people do you know who have tried to lose weight and become healthier, only to have failed? They’re part of the 80%. This doesn’t mean that they are a failure – it just means that they’re not yet part of the 20% that made their goal a reality. I’ve had the privilege of coordinating several course runs of Dave Ramsey’s Financial Peace University, where individuals and couples come to gain insight about personal finance and hopefully improve upon their situation. It’s a great course, and a course that Gina and I personally hold a debt of gratitude to (the only “good debt” I know of). But can you guess how many couples 1) show up every week, 2) follow through on the principles at home the next week, and 3) go on to change their financial legacy? You got it – about 20%. I see it in the workshops I teach for Integress Solutions as well. We want better health, we want a better life for our families and loved ones, we want to leave a positive, lasting legacy. So why is it so difficult to fall in the 20%? I think it’s largely due to going into the fight with Mr. Pareto without having a plan. It’s easy to set goals. I can teach an eight-year old to do that. But to execute with discipline and finish – now that’s the trick, isn’t it? 2013 is rapidly coming to a close. I’m already making plans for 2014 to be my best year ever. I want 2014 to be your best year ever as well. 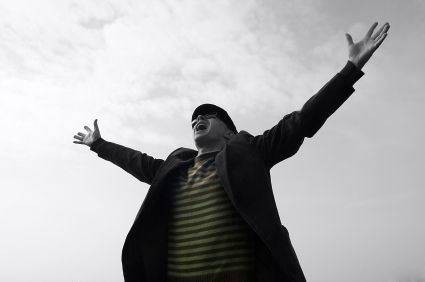 As you prepare your attack plan to have the best upcoming year possible, here are some recommendations that I’ve found that the twenty-percenters use. Remember – if you want success in a certain area of your life, you need to find out what the successful people in that area are doing and do what they do. Have someone hold you accountable. I just cannot stress this enough – in fact, I dedicated an entire article to it recently – you can find it here. I’m a big believer in accountability, because I’ve seen it work over and over again. Why is Jenny Craig so successful as an organization? I doubt it’s because they have the best tasting food on the planet. They’re successful because every week, their members need to come on down to the physical location and weigh in. Big Brother is watching, but in a good way. There is tremendous power in the knowledge that someone is going to hold you on the mat for what you told them you would do. When we first started teaching our goal setting workshop, Living Life by Design, we offered free weekly accountability calls to participants for the first 90 days. Some took advantage of the free perk, some did not. After the 90 days were over, we surveyed everybody from the workshops. What did we find? Those that followed up the practical “how to” steps for goal achievement with the added accountability afterwards showed drastically multiplied results over the other group. This was in all areas, by the way – relationships, job stability, income, success in school, you name it. If you want to beat Mr. Pareto, you need an accountability relationship. Period. Shout it from the rooftops. This is the second cousin to accountability. Simply put – tell people what you plan on doing. Lots of people. I mean, like EVERYBODY. Think about it – which of us really likes to tell the whole world what we plan on doing, only to abandon our dream after only a short while? Sharing your intent with others creates a wonderful foundation, a platform to attack from. Be prepared for a wonderful side benefit – you will find out that you have been surrounded the entire time by two groups of people. You will discover a new cheering section of people who understand your goal, believe in your ability to attain it, and spur you on to cross the finish line. Noah St. John, in his book The Secret Code of Success, calls these people in your life your “Loving Mirrors.” Every truly successful person ever to walk the planet has had a Loving Mirror in their life at one time – someone who believed in them when they needed it the most. Sadly, the second group you will encounter won’t be Loving Mirrors. Instead, they’ll be the ones to tell you that your dream is out of reach. They are the ones who love phrases like “Don’t work too hard!” and “Take it easy!” – and they mean every word of it. Deep down, some will unknowingly feel threatened by your desire for change and may even resent you for it. Regardless, stay the course. The best side effect of your Rooftop Shout – now you know who to surround yourself with, and who to limit your association with. Who knows – you may even find a success buddy who partners up with you to accomplish your goal alongside you. Make sure you check in next week for the rest of my recommendations. I want you to be part of the 20%! 2014 is right around the corner. What changes and adjustments will you be making over the next several weeks to have your best year ever? 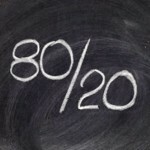 How will you end up on the winning side of the Pareto Principle? Comment below and tell us! Great article Dale! I have also heard the 80/20 rule keeps going even after it is first applied. For example, of the top 20% of sales people, 80%of THOSE results come from 20% of that subgroup. Accountability is definitely huge. Top performance requires coaching, which is a form of accountability. Thanks Dave. Yes – you can keep trickling down the 80/20 Rule and it continues to apply at the sub-levels. Three more recommendations coming next week – stay tuned and thanks for the feedback! As usual I love all your positive teachings and guidance. I am again looking for a partner to be accountable to as I did with you before. Keep up the great work and love the emails from you….. Success has always been in your life and thank you for sharing. Charlotte – great to hear from you. Congratulations on getting a jump start on 2014! What specific practice/application are you going to use to keep you in the 20%? Something you’ve read above, or something of your own? Keep on designing 2014, and make sure to check back and let us know how you’re doing!